A HUMAN PERSPECTIVE Artillery shells and sniper fire rained down on the lands below a small plateau in southwestern Syria. Airplanes bombed the military positions on the plateau itself. Families in nearby villages huddled in their homes, hoping for the shelling to stop. Israeli Army engineers struggled to build a road to enable tanks to reach the top. Thousands died in the 1967 war when Syria and Israel fought for control of the Golan Heights, also called Al Jawlan, a hilly plateau overlooking the Jordan River and the Sea of Galilee. This landform’s strategic location has made it the site of conflict in Southwest Asia for decades. It is one of many landforms that divide the region. People sometimes picture Southwest Asia as a region of rippling sand dunes and parched land occasionally interrupted with an oasis. But the lands of Southwest Asia actually range from green coastal plains to snow-peaked mountains. Southwest Asia forms a land bridge connecting Asia, Africa, and Europe. As you can see on the map on page 37, the region is situated at the edge of a huge tectonic plate. Parts of the Arabian Peninsula are pulling away from Africa, and parts of the Anatolian Peninsula are sliding past parts of Asia. Still other plates are pushing up mountains in other areas of the Asian continent. The most distinctive landform in Southwest Asia is the Arabian Peninsula, which is separated from the continent of Africa by the Red Sea on the southwest and from the rest of Asia by the Persian Gulf on the east. The Red Sea covers a rift valley created by the movement of the Arabian plate. The Zagros, Elburz, and Taurus mountains at the north side of the plate cut off part of the region from the south. Another important landform in the region is the Anatolian Peninsula, which is occupied by the country of Turkey. It marks the beginning of the Asian continent. Both peninsulas border on strategic waterways. On the southwest side of the Arabian Peninsula are the Red Sea and a strategic opening to the Mediterranean Sea—the Suez Canal. Goods from Asia flow through this canal to ports in Europe and North Africa. The Anatolian Peninsula is located between the Black Sea and the Mediterranean Sea. Two narrow waterways, the Bosporus Strait and the Dardenelles Strait, are situated at the west end of the peninsula. Both straits have always been highly desirable locations for controlling trade and transportation to Russia and the interior of Asia. Farther south is a narrow passageway leading from the Arabian Sea to the Persian Gulf called the Straits of Hormuz. These straits are the only waterway to the huge oilfields of Kuwait, Saudi Arabia, and Iraq. Because access to oil is essential to the world-wide economy, this waterway is very important. Much of the Arabian Peninsula is covered by plains. Because of the dry, sandy, and windy conditions, few activities using the land take place here. Most of the land is barren with some low hills, ridges, and wadis, which are riverbeds that remain dry except during the rainy seasons. On the southwestern corner of the peninsula, a range of mountains—the Hejaz Mountains—pokes out of the land. People living on the Arabian Peninsula have adapted to the harsh conditions by living nomadic lives in search of water. The heart of Iran is a plateau surrounded by mountains. Isolated and very high, the land is a stony, salty, and sandy desert. The foothills surrounding the plateau are able to produce some crops. Much of the Anatolian Peninsula is also a plateau. Some areas are productive for agriculture, while other areas support flocks of grazing animals such as sheep and goats. The Northern Plain of Afghanistan, a well-watered agricultural area, is surrounded by high mountains that isolate it from other parts of the region. Rugged mountains divide the land and countries. As you study the map, you will see that the Hindu Kush Mountains of Afghanistan are linked with other ranges of mountains that frame southern Asia. Afghanistan is landlocked and mountainous, so contact with the outside world is difficult. The Zagros Mountains on the western side of Iran help isolate that country from the rest of Southwest Asia. The Elburz Mountains south of the Caspian Sea cut off easy access to that body of water by Iran. Finally, the Taurus Mountains separate Turkey from the rest of Southwest Asia. In spite of these physical barriers, people, goods, and ideas move through the entire region. One of the ways they move is by water. Southwest Asia is almost completely surrounded by bodies of water. They provide vital avenues for trade and access to other parts of the region and to the rest of the world. However, because much of the region is arid, there are few rivers that flow the entire year. 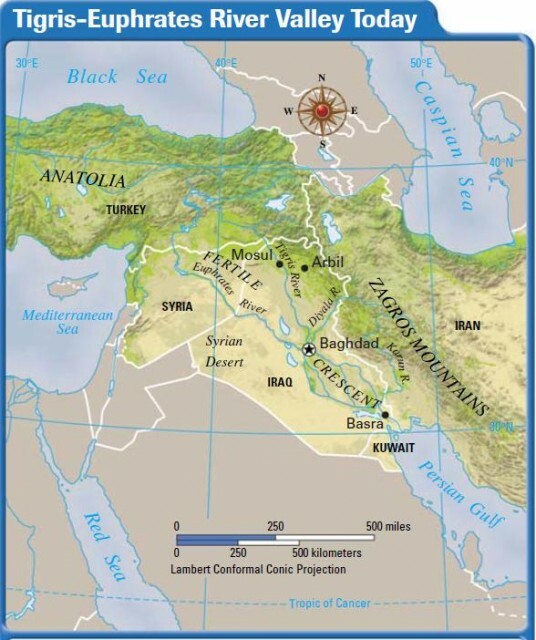 As you can see on the map on page 488, two of the most important rivers—the Tigris and the Euphrates—supported several ancient river valley civilizations in an area called the Fertile Crescent. They included Sumerians, Assyrians, Babylonians, and Chaldeans. Today, the Tigris and Euphrates flow through parts of Turkey, Syria, and Iraq. The valleys are fertile, well watered, and good for agriculture. The two rivers flow almost parallel to each other for hundreds of miles before joining at a place called Shatt al Arab. They spread out into slow moving water and swamps, finally emptying into the Persian Gulf. Tumbling down from the mountains of Lebanon near Mt. Hermon, the Jordan River provides one of the most precious resources in the entire region—water. Farther south, the river serves as a natural boundary between Israel and Jordan. The Jordan River flows into the salty waters of the Dead Sea, a landlocked salt lake. The Dead Sea is so salty that only bacteria can live in the waters. Thousands of years ago the earth was heaved up on the south end of the area now controlled by Israel. The outlet to the sea was blocked, creating the salt lake. The Dead Sea is 1,349 feet below sea level—the lowest place on the exposed crust of the earth. It is almost impossible to think about resources in Southwest Asia without including oil. It is the region’s most abundant resource. Major oil fields are located in the Arabian Peninsula, Iran, and Iraq, with natural gas fields close by. Since these fossil fuels run cars and trucks, factories, and power plants all over the world, they provide the major portion of income for nations with petroleum reserves. Today, about one-half of the world’s oil reserves are found in Southwest Asia, along the coast of the Persian Gulf, and at offshore drilling sites in the Gulf itself. The presence of these large reserves has made the region important because so many countries, including the United States, depend on its oil. The most valuable resource in parts of Southwest Asia is water. In mountainous lands such as Turkey, Iran, Lebanon, and Afghanistan,water is plentiful compared to the rest of the region. It can be harnessed for hydroelectric power. However, elsewhere, water is a scarce resource that must constantly be guarded and carefully used. Efforts to conserve water have been a part of the culture of the people living in the region for thousands of years. Southwest Asia has deposits of other resources such as coal, metallic minerals such as copper, and non-metallic minerals such as potash and phosphates. However, the deposits are scattered and not very large. Iran and Turkey have good-sized deposits of coal. Around the Dead Sea are significant reserves of salts such as calcium chloride. However, these salt deposits, which are used in manufacturing and chemical processes, have not been heavily developed. The harsh land and the desert climate that you will learn about in the next section make life in this region a challenge.